Pialligo Estate’s head gardener, John Sanderson. Photos: Supplied by Pialligo Estate. After almost forty years in horticulture and civil construction, Pialligo Estate head gardener John Sanderson says he is finally working in his dream job. It’s a role that for the first time in his career essentially brings together every facet of his broad experience. 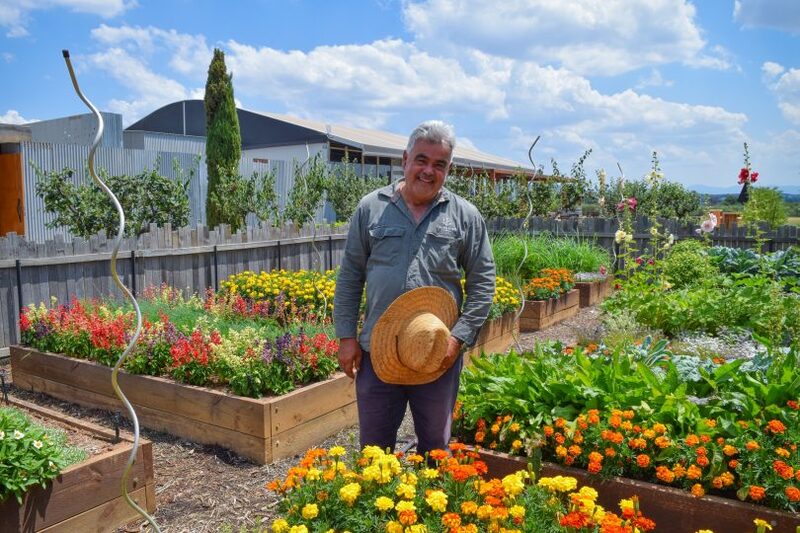 John’s experience is integral to Pialligo Estate’s ‘Paddock to Plate’ philosophy, where most of the natural ingredients used in the restaurant are grown on the 58 hectares rolling down to the Molonglo River. The fertile, fine silt, alluvial loam that was once part of the original Duntroon farm, is perfect for growing up to 35 different variety of fruit used in cooking. The soil is so fertile that some trees are producing twice as much as expected. Then there is the lavender, the crepe myrtle, the vineyard, the olive grove, the herb garden and the vegetable garden. 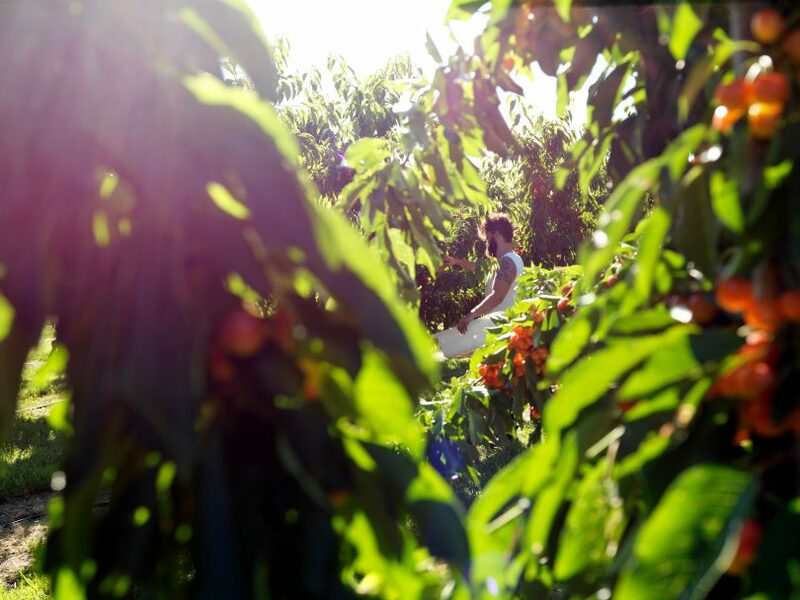 Pialligo Estate’s fertile soil is perfect for growing a variety of fruit and vegetables. The vegetables are grown in consultation between John and head chef, Darren. Sitting in one of the outdoor dining tents set up on the banks of the Molonglo amongst the vineyard and the fruit, you could be anywhere in the world if not for the recognition of Parliament House and Mt Majura as a backdrop. This is a reminder that, thankfully, this setting is right here in Canberra. From my vantage point, the main restaurant can be seen and I can imagine how beautiful this site is for weddings and other significant and memorable occasions. This is the setting that I happily settle into whilst interviewing John about his work here at Pialligo Estate. John graduated from Hawkesbury Agriculture College in 1985, before heading out west to learn his craft. From there he has worked in every facet of the industry including nurseries, civil landscape construction and hydrology. He is excited by the direction taken by Pialligo Estate with a focus on quality over quantity and the move to future-proof the farmland from drought. His biggest battle is with the vagaries of the weather, the ducks that have taken a liking to the lettuce, and the cockatoos that are drawn to the fruit. 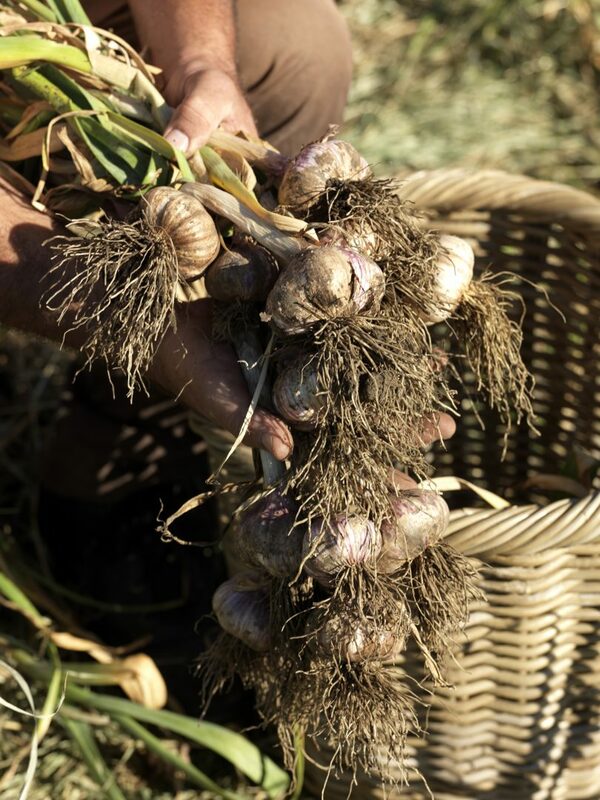 Freshly picked garlic from the Pialligo Estate. Beyond its beauty, Pialligo Estate is a working property, but one that takes advantage of being on the edge of a city. John explains how the Estate makes the most of this proximity. He says that one proposed initiative is to allow CIT students to use the Estate as a ‘green’ classroom. John wants to demonstrate how land can be developed and improved for the long term in a sustainable and productive way. This first-hand experience at Pialligo Estate will mean that young students will learn how to work with the environment whilst growing a variety of edible produce. John clearly loves where he works and the variety of initiatives undertaken and proposed. He knows he is part of something special at Pialligo Estate. From this vantage point, it is hard to disagree. Find out more about Pialligo Estate here.